Vinyl tile is the perfect flooring option for those of us who prefer to do things on their own. Even though it’s floor installation we are talking here, the simplicity of it all twined with the ready-to-use adhesive backing of vinyl makes it seem more like a game of Tetris or Lego, something DIY buffs can definitely get behind. In addition to upgrading your home, these tiles guarantee that you will have a lot of fun doing it. Vinyl tile floor has all the same qualities sheet vinyl is praised for. It’s water and dirt resistant, doesn’t stain and offers a pleasantly soft support for your feet. If vinyl tile is a floor you want in your home, here’s a comprehensive guide to help you get it there. First thing on the list is to determine how much vinyl you’ll be needing. To do so, you’ll have to measure your floor. Don’t worry if the room has a complex shape, you can always measure individual areas and add them up. Once the measuring is over there are two ways to find out how much vinyl you’ll need to cover the entire surface. Either divide the area of your floor by the area of a single vinyl tile to get the needed number of tiles or by the square footage contained in a carton for the number of cartons. Since it’s highly unlikely you’ll be buying the tiles one by one, the second method is more effective and time-saving. Before you place your order, don’t forget to get some extra. Slip-ups do happen, you might cut some of the tiles too small to fit the borders or lay them down at a wrong angle. It’s always preferable to have some extra vinyl at hand. 10-15% of your estimated amount is usually enough to cover all possible accidents. For a better visual appearance floor tiles are usually centered at a doorway. When making a layout you want to cover as to fit them in the areas where the tiles meet the walls but try to maximize their size and minimize the number. The goal is to end up with at least half a tile width at those edges. Try to place badly sized tiles as far out of the sight as possible, the trick is to hide them under trims or furniture later. To avoid any surprises and miscalculation on the way, draw a scale plan of your floor on a piece of paper and a scaled grid on tracing paper to correspond the tiles. This way you can place the grid on the plan and move it around to choose the best layout for your room. While you are at it, you might also want to experiment with different patterns by using coloured pencils to color into the boxes. Before you go ahead with actually laying down your vinyl tiles there are certain things to take into account. Vinyl expands and contracts depending on the environment it’s in. Before you install it, let the open boxes sit in the room for at least 48 hours for the tiles to get acclimated. Also, make sure you follow any product-specific instructions your vinyl manufacturer might have provided. Clear your floor from all the trim on the edges. If you plan to reinstall them later, make sure to be extra careful with removing nails so there is as little splitting as possible. The safest bet is to pull the nails out through the trim from the back side. The surface you are lying down the vinyl tiles on should be as flat and smooth as possible. Any unevenness or bumps will cause it to develop blemishes over time. Clean your floor properly, get rid of any debris, grease or wax beforehand. Vinyl tiles can be installed on pretty much any floor but there are some differences in the process you should be aware of in advance. To install vinyl tiles on concrete or ceramic tiles, the surface should be clean, flat and dry. If there are any cracks or imperfections they should be fixed using a sealer. High spots can be flattened out using a coarse-grit abrasive on a belt or disc sander. Cold chisel and a baby hammer can be used to remove any minor bumps from the surface. It is possible to install vinyl tiles over an old vinyl flooring as long as the old floor isn’t in too bad of a shape. Any minor imperfections like small dents and dings can be fixed by applying a coat of embossing leveler. This will smooth the surface and prevent the new vinyl from following the shape of the floor underneath. However, if there is more damage to your old vinyl floor than just some rough patches you should get rid of it altogether. f the floor is far too damaged for any embossing leveler or sealer to do the trick and getting rid of it is too difficult or expensive you can cover it with a layer of plywood. Needless to say that the plywood itself should be smooth and cleared of any imperfections before the vinyl tile is laid down. Underlayment can also be used for extra thickness or better grip. Plywood surface as well as glass, hardboard, lacquer, painted enamel, steel, aluminium, and many kinds of plastic offer the best adhesion. When laying down the underlayment make sure to leave a 32-inch gap between the panels and a 1/8-inch gap along the walls to allow the sheets to expand. It can be stapled onto the old floor with 7/8-in. narrow crown staples. For the best stability place staples 4 inches apart in the center of the sheet and 2 inches apart along the seams. Try to use as many full sheets as possible and trim the edges only when necessary. To ensure smooth functionality of your doors you’ll need to trim down the door opening so the tiles will fit underneath. To do so place a tile upside down in front of the door frame to serve as a height guide. You can use a saw or utility knife and sharp chisel for cuts that are tight. Next step is to transfer your desired layout from paper to the underlayment. Chalk lines are the easiest way to do so. The rule is to starts laying down tiles from the centre. To find the center of the room you’ll have to find the centers of both sets of opposite walls. Use these points to snap a chalk line across the floor in both directions. You’ll end up with two lines crossing in the centre creating four rectangles. Use a carpenter’s square to make sure the lines square. Trial-fit a row of tiles down both lines following the width and length of the room without removing the peel and exposing the adhesive backing. It will give you a sense of what you are aiming for and show if there are any changes that should be made to your original layout. Use a pencil to darken the lines before you sweep the surface one last time. Finally, it is so far. Full tiles are installed first. Start at the intersection, peel off the protective backing and lay down the vinyl tiles along the layout lines. Continue to work in a stair-step fashion to keep the tiles aligned. Use a floor roller every couple of rows to apply pressure and attach them securely to the underlayment. Once you have covered the area with as many full tiles as you can you’ll need to cut vinyl to fit the borders. Use a heat gun for about a minute to warm the tile and make it flexible, then cut it with a utility knife. Then cut the tile using a utility knife. 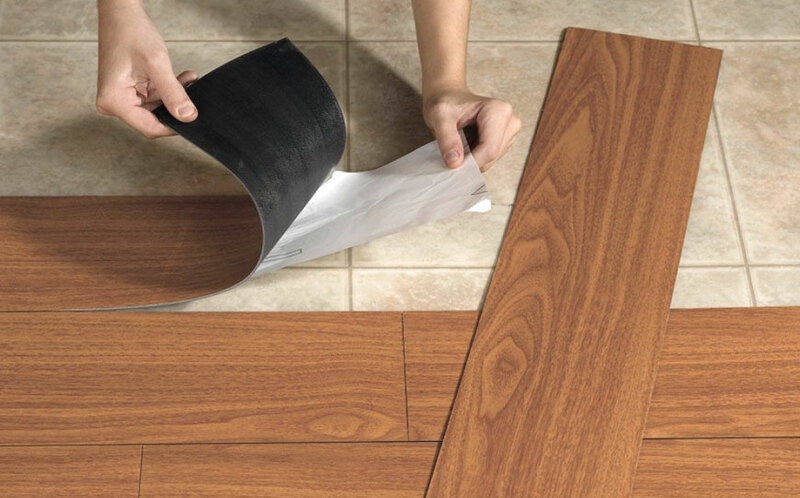 You can cut vinyl tiles that simply need to be trimmed along the length by placing the tile atop the last full tile close to the wall, then situate another one to overlap the loose tile. Use a knife to cut the overlapping section off the top tile. Use the trimmed section to cut tiles for the same row. Irregularly shaped tiles can be easily trimmed using a cardboard template. Once the entire floor is covered, do a couple more rounds with a vinyl floor roller and then let it sit undisturbed for the recommended period of time. This means no walking for at least a few hours, no moving furniture for 2 days and certainly no cleaning at least for a week. This way the adhesive will have time to settle and develop a stronger bond.